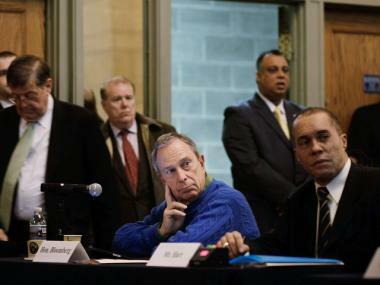 Mayor Michael Bloomberg waits to speak in Grand Central Terminal at a hearing about high-speed rail networks January 27, 2011 in New York City. MANHATTAN — Mayor Michael Bloomberg thinks the country has a thing or two to learn from Shanghai's speedy trains. Bloomberg joined other state leaders to push for new investment in high-speed rail in the region at a Congressional hearing held at Grand Central Terminal Thursday. The mayor warned that the region's corridors are already painfully congested and that new and faster rail lines are crucial to maintaining the region's economic strength. "The Northeast is approaching a transportation crisis. Our airports are among the most clogged, our highways are among the most congested, and our train corridor is the most heavily used in the country," he said, according to prepared remarks. Bloomberg went on to share his experience arriving in Shanghai in 2007 and boarding a "magnetic levitation train" capable of traveling at 250 miles an hour. "Other countries in Asia, Europe and the Middle East are building bullet trains too. So what is America waiting for?" he asked. Amtrak's Acela service between New York and Washington, D.C. currently travels at an average of about 83 mph, according to the House Transportation and Infrastructure Committee. Amtrak is now considering a $117 billion "Next Gen" High Speed Rail plan with trains that would travel up to 220 mph, slashing the travel time between New York and D.C. to 1 hour and 36 minutes, according to Congressman Jerrold Nadler, who makes the trip every week and also testified at the hearing in favor of expanded rail. The hearing came two days after President Barack Obama renewed the call for high speed rail during his State of the Union address. Bloomberg joined other state leaders to push for new investment in high speed rail in the region at a Congressional hearing held at Grand Central Terminal Thursday. Wearing the same bright blue sweater he'd donned for a morning snow update, Bloomberg warned that the region's corridors are already painfully congested and that new and faster rail lines are crucial to maintaining the region's economic strength. “The Northeast is approaching a transportation crisis. Our airports are among the most clogged, our highways are among the most congested, and our train corridor is the most heavily used in the country,” he said, according to prepared remarks. Bloomberg went on to share his experience arriving in Shanghai in 2007 and boarding a magnetic levitation train capable of traveling at 250 miles per hour. “Other countries in Asia, Europe and the Middle East are building bullet trains too. So what is America waiting for?” he asked. Amtrak's Acela service between New York and Washington, D.C. currently travels at an average of about 83 miles an hour, according to the House Transportation and Infrastructure Committee. Amtrak is now considering a $117 billion ‘Next Gen' High Speed Rail plan for the Northeast with trains that would reach speeds up to 220 miles per hour, slashing the travel time between New York and D.C. to 1 hour 36 just 1 hour 23 minutes between New York City and Boston, according to Congressman Jerrold Nadler, who also testified at the hearing in support of better rail.